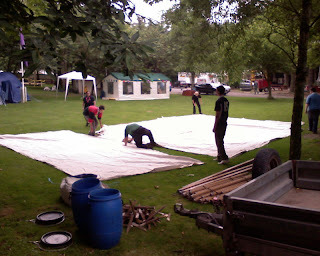 Above : Helping set up one of the marquees before the groups arrive. Currently underway at Fordell this week is the Festival Camp, a joint Scout/guide activity event for approximately 650 participants (including staff). Hopefully we should have a good few photos from the midweek activities soon, but for now here's a quick look at what happened last weekend during the preparations. 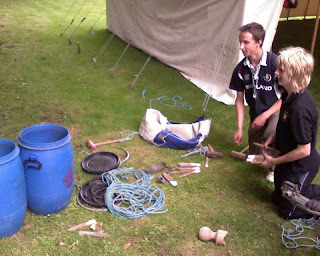 The camp has scouts and guides from throughout the UK and Ireland, and a few international groups too (including the USA and Sweden) - much more information can be found on the official website (click link in the first paragraph), including photos of the previous camp in 2004. Although the participants didn't arrive until sunday, a huge number of staff (service team) turned up a day ahead in order to set up a lot of the facilities. Approximately 300 staff were involved in this and most chose to arrive on the saturday morning. Above : At last, the TV reception problems in the staffhut were solved. 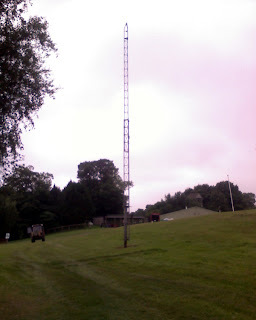 Since the last blog update there are a few obvious changes onsite - the biggest being the radio mast near the flagpole which has been erected for the local radio group (who are meeting on site regularly and providing activities for groups). A few more flagpoles have also miraculously grown, just in time for the extra flags which are needed for the Festival Camp. Saturday was fairly busy but with no shortage of staff from either side - the Fordell staff spent the day cleaning toilets. 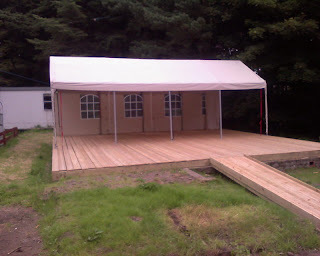 putting up a few marquees and generally moving things around with trailers. The Festival service team meanwhile were busy setting up the 10 subcamps which each included marquees, store tents, gateways/fences and sleeping tents. By around 5pm most tasks were finished and it time to unwind for a while with a great barbeque provided by one of the Edinburgh Scout Fellowships. The food was great and although there was a huge queue to start with it moved quickly due to the impressively efficient serving team. 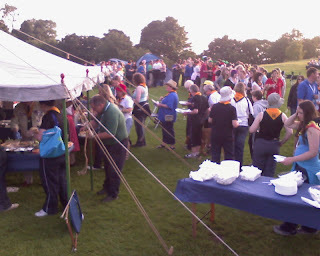 A couple of hours later and everyone was settled in - and it was time for the first meal, a fire drill and the opening event. 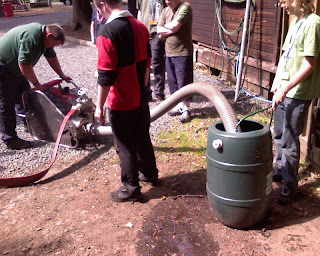 Above : Fordell Fire Brigade testing out pump. Despite the best efforts of nine staff, the pump wouldn't work so a quick phone to the fire station resulted in a visit from a fire engine, control vehicle and several curious fireman who quickly showed us how it was supposed to work. Next week of course, there's another similarly big event taking place - for young firefighters - so there shouldn't be any problem keeping the pump running then. That's it for now, but all going well we should have a few more photos of the camp (which finishes saturday) soon.